La Casa Del Tunel (Tijuana, B.C.) once housed the entrance to a smuggling tunnel and is directly across the street from a now defunct hotel still remembered through music and folklore as a hub for human smuggling. The tunnel, located in the lower level of the La Casa, was filled with concrete by the police and later covered with flooring in an attempt to erase its memory. 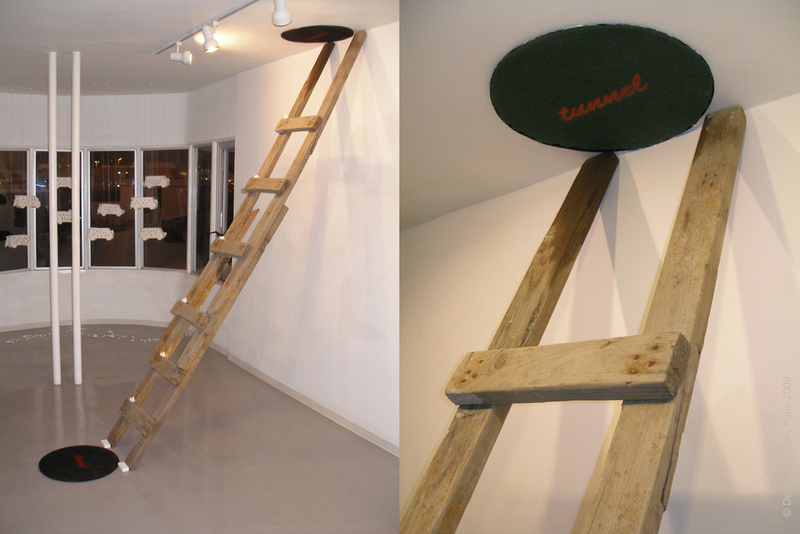 The artists have re-created the tunnel with portable pads in the fashion of “ACME” holes (as seen in 1960’s era cartoons) with the words “tunel” and “tunnel” displayed on either side of the pad. The ladder seen in the installation photo is the original ladder used to access the tunnel.